Bitcoin is a payment system, which is so revolutionary it gives Bitcoin its value. Imagine an Excel spreadsheet with a list of account balances. This account owns this much, that account owns that much, etc. To send money, the balances just get subtracted from and added to. That’s it. But Why Is Bitcoin a Big Deal? Bitcoin is internet money that can be transferred nearly instantly to anywhere in the world. It is not managed or controlled by any company, bank, or government. 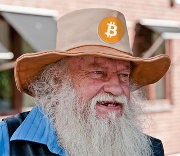 The Bitcoin system is a public network of people’s computers running Bitcoin software. Bitcoins are numeric amounts tracked on a public ledger. Bitcoins cannot be arbitrarily created and the total amount is limited to 21 million. The Bitcoin software is free and open source. Its usage has accelerated globally since being released in 2009. Bitcoin solves the problem of getting computers, that may not trust each other, to securely track transactions and agree on updates to a public ledger. It’s changing the way people think about money because it eliminates the need of a centralized middleman to manage the money supply and facilitate transactions. Bitcoin is a gonna change the world. But there’s a lot of complications to it — hell, even most computer geeks don’t understand what Bitcoin is or how it works. So I made this here website. It’s just a humble attempt, by a common hillbilly, to explain the basics of Bitcoin… without making folks go cross-eyed. The articles below will get you started with the fundamental basics of Bitcoin. Dig in and enjoy! Explanation originally from solomania9 on the Bitcoin subreddit.